When you work with Delta Physician Placement, you won’t work with multiple recruiters. You’ll have one consultant who is focused on your business needs and simplifies what you see from dozens of recruiters within the organization. Your consultant will be available 24 hours a day to get results and make your job easier. At Delta Physician Placement, we believe that service is making a quality connection; and how we go about that service constantly evolves. We seek and utilize direct feedback from customers on ways to better improve the experience. This doesn’t happen by chance; this kind of service and experience is the result of calculated and measured efforts from our dedicated team, gathered through the Customer Experience Index (CxP). The CxP is a tool we use to gage our company’s Net Promoter Score (NPS). The two-question survey goes out to every customer in which we engage and input from the survey is evaluated four times per year. The Delta Companies understands that customer service in recruiting or staffing is “what we do” and experience is “how it’s done.” Understanding the impact each of our employee’s has on a customer’s life is pivotal to the purpose of The Delta Customer Experience. Only through this understanding and accepting of responsibility do we go beyond customer satisfaction to earn customer loyalty. Providing an experience that goes above expectation is what compels customers to work with us. Delta Locum Tenens maintains a NPS score that doubles the industry average — but to us, this is the only acceptable standard of service. From initiating a search to profiling your facility in order to locate the most compatible candidate, our goal is to make your experience simple, expedited and easy. When you work with Delta Physician Placement, you’ll have one personal consultant who will work directly with you to handle all of your healthcare staffing needs. Our procurement team makes contact with talented and available providers everyday from all parts of the country and in all settings. Then, our proficient recruiters give you access to a high caliber of candidate through proactive and effective screening. While clients continue to benefit from the business’s national advertising, national presence, and dedicated one-point of contact account manager approach, our specialized recruiting efforts have cut submission and position fulfillment turn time in half. Plus, we are always open. Before we can locate your ideal candidate, we first have to establish your criteria and the specific needs of your organization and community. This is why we take the time to visit your facility first hand, so that we can learn the ins and outs of your organization and find the right provider for your needs. Our onsite profiles allow us to provide in depth advertising, first hand answers, and the expertise to locate and advise top candidates for your needs. Curious about the status of your job search? 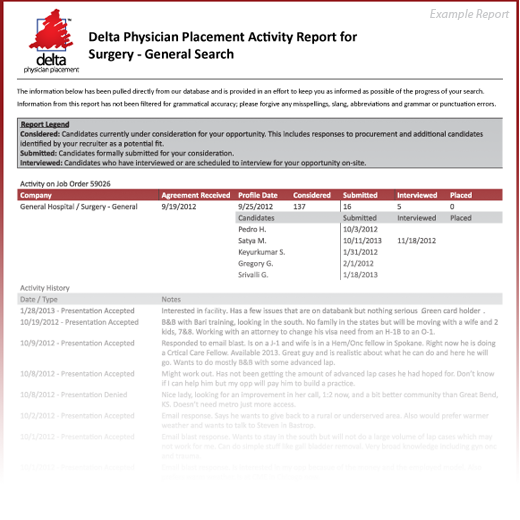 In response to multiple comments in previous CxP surveys from clients requesting tangible, printable status reports, Delta Physician Placement has developed a Client Portal that will allow clients to access activity updates on all open job orders. This ability to instantly track progress on your search through our Client Activity Report, gives clients a window into the world of recruitment services. With this portal report, you can see exactly what feedback, good and bad, your recruiter received from potential candidates. Learn what potential candidates are saying about your opportunity, community, and/or process — how does your offering compare to others in the market?